Before you read this post, close your eyes for five or ten seconds and imagine the most magnificent place on earth. Okay, times up. If you envisioned a land with sweeping fiords, snow-capped sawtooth mountains, stunningly blue lakes, and rolling green hills, you’ve imagined the South Island of New Zealand. Yes, New Zealand has all of this and more. With every turn of the head, the South Island offers magnificent views to delight the senses. In February, my family and I circumnavigated nearly the whole island in an Outdoorsy campervan. If you only have a weekend to explore, here’s how to best spend your 48 hours. 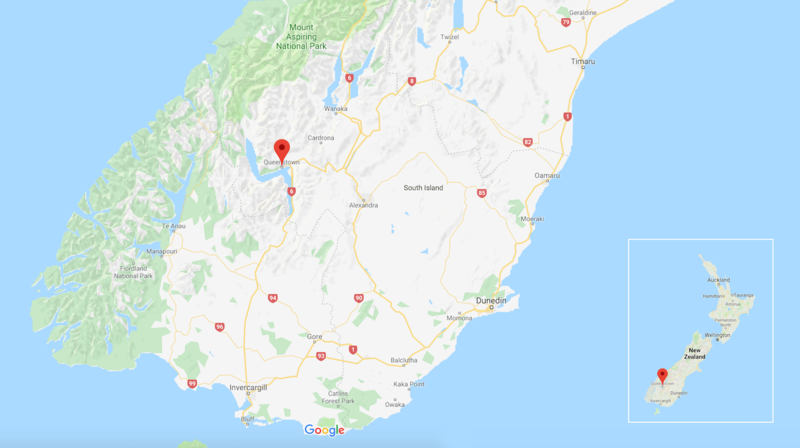 Map of the South Island of New Zealand. Thanks, Google. Start in Queenstown, a booming resort town situated on the shores of Lake Wakatipu in the southwest corner of New Zealand’s South Island. Surrounded by The Remarkables, Cecil Peak and Walter Peak, there’s no shortage of jaw-dropping vistas. To be clear, the town primarily caters to thrill seekers and ski tourists. On our adventure though, my family and I opted out of the adrenaline rushes and ski slopes, opting instead to chart a course for the solitude of the open road, wandering trails and remote campsites. 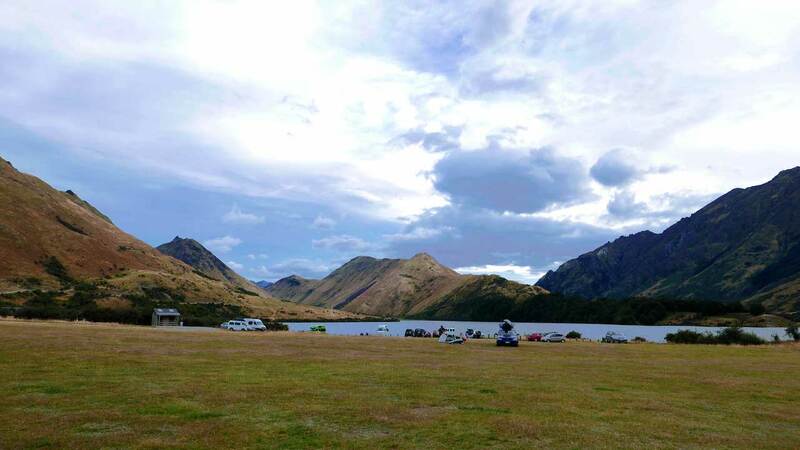 Spend your first night camping under the stars at Moke Lake. In this part of the world, there is so little light pollution that reaching out and touching the stars is a snap. I’m only kind of kidding. Just 15 minutes north of the Glenorchy-Queenstown Road, Moke Lake is easily accessible by camper or car and offers fantastic recreational activities like kayaking and canoeing, horseback riding, hiking (also known as “tramping” in NZ), running and swimming. For those interested in horseback riding, you can easily arrange day-long or overnight treks with Ben Lomond Station Horse Treks, conveniently located adjacent to the campsite. Our camp spot at Moke Lake. Not interested in sitting atop a fuzzy four-legged friend or gliding over the stunning lake? Perhaps a walk is in store. The lakeside trail is silky smooth and takes anywhere from 90 minutes to two hours to hike. The NZ Department of Conservation’s website rates the trail as “easy.” Just lace up your all-terrain shoes and go for it. You’ll have no regrets. As you stroll the shores of this picturesque lake, be sure to pinch yourself every so often and remember that you are in New Zealand. The reflections of the surrounding mountains, sublime colors, and the sound of silence will surely gratify your senses. A quick note about getting to Moke Lake: The road leading up to the lake starts out paved but within a few kilometers turns into gravel. At that point, you’ll see a road sign (New Zealanders love road signs) indicating that you should continue only if you’re in an AWD vehicle. Disregard this sign, as we did, because the road was plenty good for our Class C camper and the dozen or so other cars, vans, and campers with whom we shared the campsite. 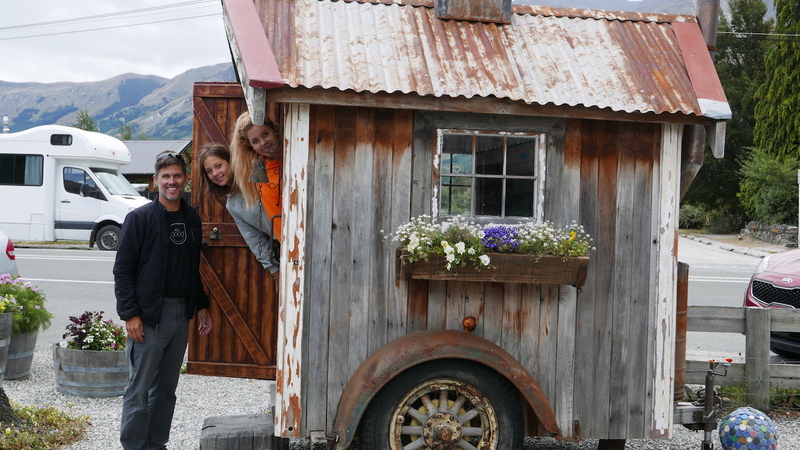 Day 2: To Glenorchy we go! Headed to Glenorchy on the Glenorchy-Queenstown Road. Glenorchy is a popular tourist spot that’s less than an hour’s drive north/northwest from your campsite at Moke Lake. 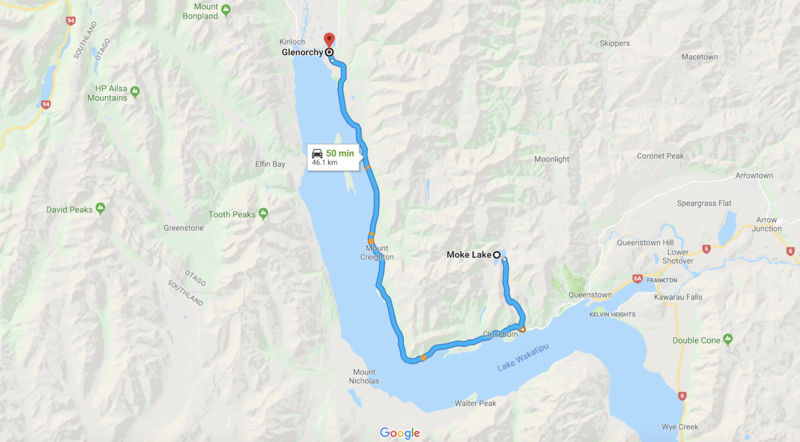 Once you harness the willpower to peel yourself away from paradise, fire up the rig and head back to the main road, take a right, and drive 52 minutes to Glenorchy. Lake Wakatipu will be on your left the entire way. If for some reason it isn’t, turn your phone around. 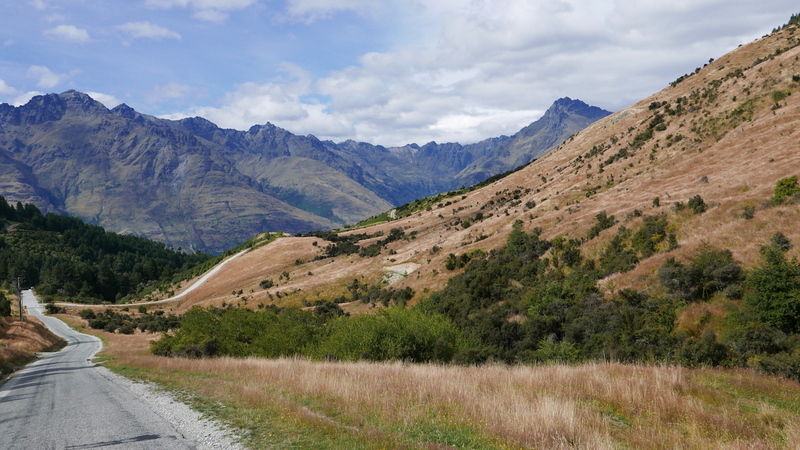 Out of the 1,200-plus kilometers that my family and I drove on the South Island, these 45.3 klicks of twists, turns, crests, and valleys were our favorite. Take this drive slowly and absorb all that it has to offer. Be sure to stop at the designated lookout spots. They’re worth it. If you have the inclination to hike along the way, Bob’s Cove or Lake Dispute are two good options. After 50 minutes or so, don’t blink or you’ll miss Glenorchy. You’ll know you’ve arrived when you see Mrs. Woolly’s General Store on the right – a must stop. Since you’ll be driving on the left hand side of the road (don’t worry, you’ll get used to it), pull onto the shoulder where there’s ample space just across from Mrs. Woolly’s. As you might imagine, the prices are a bit inflated. Still, we encourage you to open your wallet and help the local economy. My two daughters loved the chai lattes. Me? The homemade chocolate. Outside of Mrs. Woolly’s General Store. 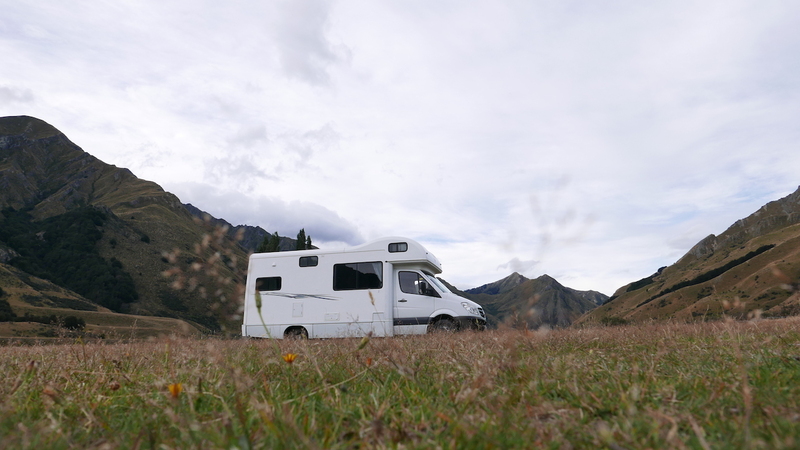 Our trip around the South Island was a search for solitude, wandering trails and remote campsites. 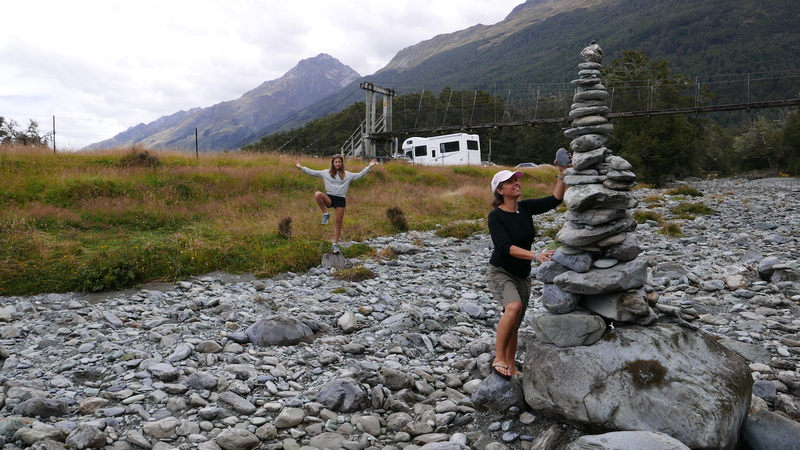 Although you can rest your head in Glenorchy at Mrs. Woolly’s Camp Ground (she must own half the town), we recommend you head further north to the Lake Sylvan DOC campsite along the Routeburn River. It’s only 25 minutes up the road. From there, walk to Lake Sylvan or spend some time tramping the first few kilometers of the world famous Routeburn trail. If you’re a fisherman or fisherwoman, we hear fly fishing on the Routeburn River is exceptional. Playing with rocks along the Routeburn River. Depending on the season, other adventurous activities in and around Glenorchy include jet skiing (not for the faint of heart), horseback riding, kayaking, mountain biking, skiing, snowboarding, skydiving, and boating. To wind down your trip, meander your way back to Queenstown and review where you’ve been and what you’ve seen — stars at arm’s length, eating Mrs. Woolly’s freshly baked bread, hiking Lake Sylvan and wandering from one paradise to another. 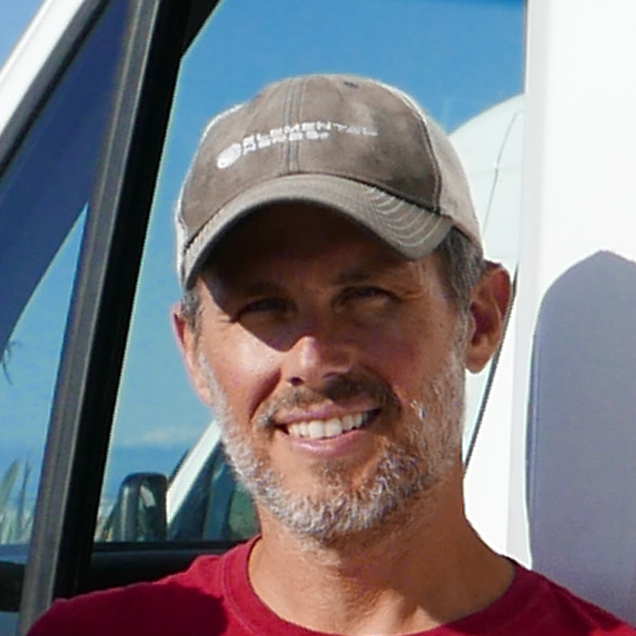 Outdoorsy RV owners make up to $32,000 a year renting their RVs. Your next adventure starts here by searching thousands of available RVs for rent. World traveler and creative guy with a thirst for living on his edge. Follow his family's trip around the planet at @ourallgoodadventure.